Unique dance education promoting human connection and community by fostering creativity and collaboration. At La Crosse Dance Centre, dance is an art form, not a commercial endeavor. We are committed to bringing the highest quality dance education to each and every student through classes, rehearsals, and performances. Our program ensures that every student enjoys a structured yet enriching and encouraging environment most conducive to learning. At LDC, our philosophy is to train our students as dance artists. We do not believe in dance competitions because we feel dance as an art cannot possibly be judged with a score card. At LDC, we guide an environment that helps our young artists realize they have the gifts and strengths within themselves to make a positive difference in our world. We do not believe in putting dancers, dance, or young dance artists into any type of box, but rather we strive to provide a safe, yet challenging environment in which we can help our students think and dance outside the lines. We make every choice regarding our program with the intention of helping our young dance artists realize they have the strength and gifts, to do whatever they choose to do, and their time with us will be a nurturing time for them to explore who they are and who they want to become. Dance is our language, or medium for this. 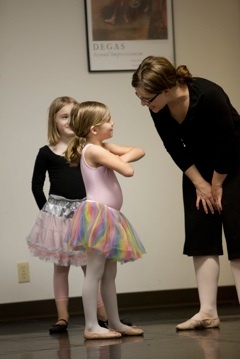 Each class and rehearsal at LDC exemplifies the above philosophy. Instructors teach safe, progressive warm ups which concentrate on keeping dancers’ bodies healthy and strong by achieving proper technique. Students learn about important kinesthetic and anatomic principles as they develop an appreciation for dance and explore their own creative processes. We are committed to each student’s entire dance education, providing the student with a strong and thorough base, so as to be able to pursue dance at a collegiate or professional level as well as gain a lifetime passion for the art form. Individual attention is one of our fundamental beliefs for executing this commitment; class size is limited to no more than fifteen students. Above all, students of all ages have fun while gaining self-confidence, learning valuable skills in cooperation and working with others, and acquiring critical thinking skills obtained from an arts education.